In this podcast, Ricardo makes his retrospective of 2014. Two of the points highlighted by Ricardo, among others, are the growing popularity of project management and the availability of various types of software to help the project manager, from the amateur to the professional. 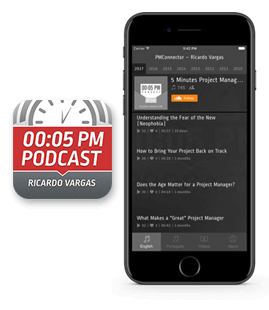 In this podcast, Ricardo is incisive on commenting the relevance and importance of the correct use of project management software. He makes it clear that the fundamentals of project management can not be forgotten because they are much more important than the mastery of any existing software. Software Development Projects: Are There Too Many Tribal Chiefs to Few Indians? Why I need to understand the concept and know how to calculate the project critical path? In this podcast, Ricardo talks about the project critical path and explains that the use of softwares to calculate the critical path, causes the manager forget the basics and concepts of project management. Ricardo also explains that the critical path consists of the activities that directly determine the duration of the project and this activities are not necessarily more expensive or riskier in the project. In this podcast, Ricardo talks about the softwares that support project managers and what it takes to be a good tool. He also talks about the importance of having committed companies behind the good tools, so as to assure the continuity of these softwares. This podcast was recorded only in Brazilian Portuguese. The link below is for the Brazilian Portuguese version.